Jean Bindl and Marilyn Schmidt will be co-hosting this year’s trip to Branson. On our way to and from Branson we’ll overnight at the St. Louis Drury Inn where we’ll enjoy a fun and relaxing “Happy Hour” of complimentary food and drink. 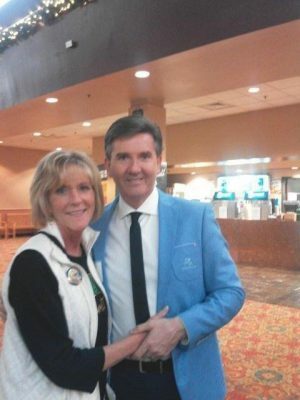 While in Branson we’ll enjoy the following six shows: Christmas with Daniel O’Donnell; Texas Tenors; Christmas Wonderland; “Six”; The Baldknobbers; and Down Home Country. Four breakfasts, three lunches, two suppers (plus two hotel happy hours with food and drink), four nights lodging, motor coach transportation, luggage handling, and our tour escorts are included. Minimal walking. Contact us for a detailed itinerary. A $100 deposit per person is required to hold a spot. Balance is due September 15, 2019. Optional trip cancellation insurance is available for $94/person. Spots are limited. Departures from: LaValle, Reedsburg, Baraboo, Sauk City, & Madison.